Stylish, mind-bending noir brain teasers. Shift Quantum is coming to the PC Gamer Weekender, bringing with it a unique take on the puzzle genre. 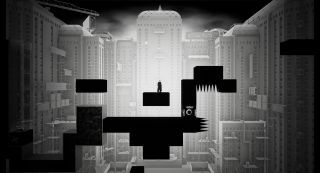 A cyber-noir action-puzzle platformer, Shift Quantum features an unusual mechanic known as SHIFTING. This changes the world around you, twisting the environment in mind-bending ways that help you solve each “brain-drilling” (their words) level. The studio behind Shift Quantum is Belgian indie Fishing Cactus, a team made up of 30 people and creator of Epistory—Typing Chronicles. You can find more on Fishing Cactus here, while Shift Quantum’s details can be seen on its official site, Twitter or Facebook—and you can join in the chat on the game’s official Discord channel. It’s not just Shift Quantum—you’ll also be able to see many more speakers, games and booths all at the PC Gamer Weekender, which is being held February 17-18 at the Olympia, London, in the UK. For more details see the site, and follow us on Twitter for up-to-the-minute news. Tickets are available now from £12.99.